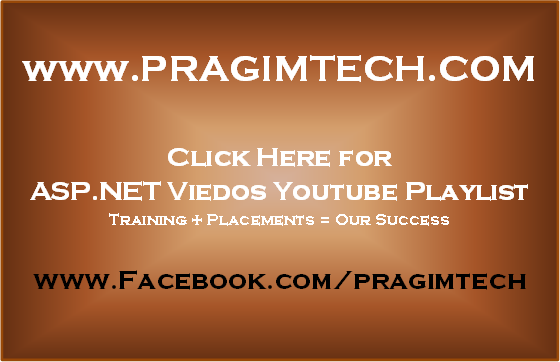 In asp.net video series, in parts 104 to 111, we have discussed about asp.net user controls. Please watch user control videos by clicking here before proceeding with this video. In this video we will discuss about, asp.net composite custom controls. Unlike UserControls, Composite controls are created completely in code. In the next few videos we will be creating a composite custom calendar control, that is similar to the one in the image below. In parts 104 to 111, we have discussed about achieving the same, by building asp.net CalendarUserControl. 1. When the user clicks on the calendar image button, the calendar should be visible. 2. 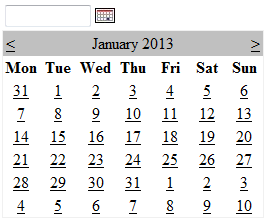 Once the user selects a date, from the calendar control, the textbox should be populated with the selected date, and the calendar should become invisible. 3. In the "New Project" dialog box, select "Web" from "Installed Templates". 4. Select "ASP.NET Server Control"
6. Choose C:\ as the location and click "OK"
At this point "CustomControls" project should be created. In the solution explorer rename "ServerControl1.cs" file to "CustomCalendar.cs". Click "Yes" on the message you get. Copy and paste the following code in CustomCalendar.cs file. The code is well commented, to describe the purpose of various attributes and methods, that we used. // that contains all the common functionality needed by all composite controls. At this point we are done, building the composite custom control. However, there will be several problems with this control. In the upcoming videos, we will discuss about solving the problems one by one. In our next video session, we will discuss about using this composite custom control in an asp.net web application. Sir I am getting enormous benefits from your blogs and videos.As soon as I get a job I will give you a part of my salary as a GuruDakshina.